WinISO can reduce ISO image size by Merge Duplicated Files. With this feature enabled, WinISO scans all files in an ISO image and tries to find the files with same content while saving, makes duplicated files share one same data block, and removes other duplicated data blocks. 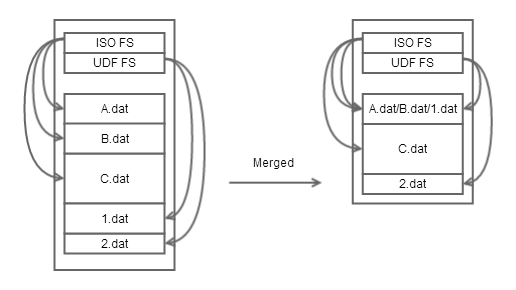 The contents of file A.dat, B.dat and 1.dat are identical.